The SNP that is most strongly associated with blue eyes is rs12913832. It’s on chromosome 15 in intron 86 of the HERC2 gene, and two copies of its mutant G allele result in reduced expression of the nearby OCA2 gene, which in turn reduces production of melanin in the iris. There’s a lot of information about this SNP on its SNPedia page. 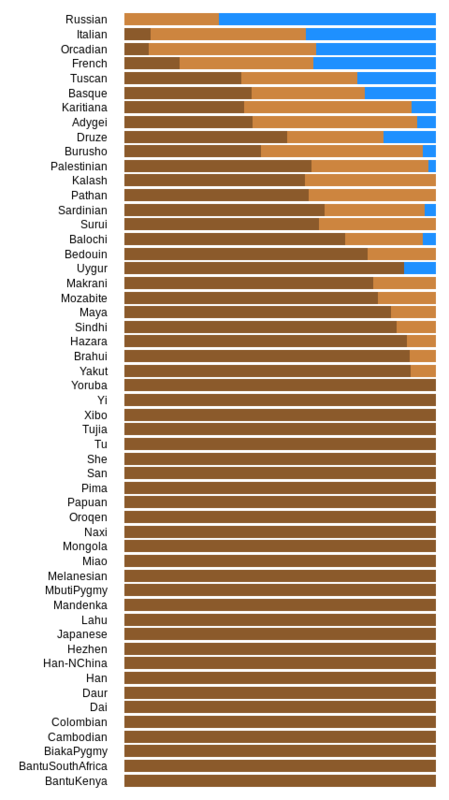 According to that page, the AA genotype results in brown eyes 80% of the time, the AG genotype also results in brown eyes, and the GG genotype results in blue eyes 99% of the time. I calculated the allele and genotype frequencies for rs12913832 for all of the HGDP populations. The results are below. The G allele is present in the Karitiana at a frequency of 0.346, and 7.7% of them are homozygous for it. 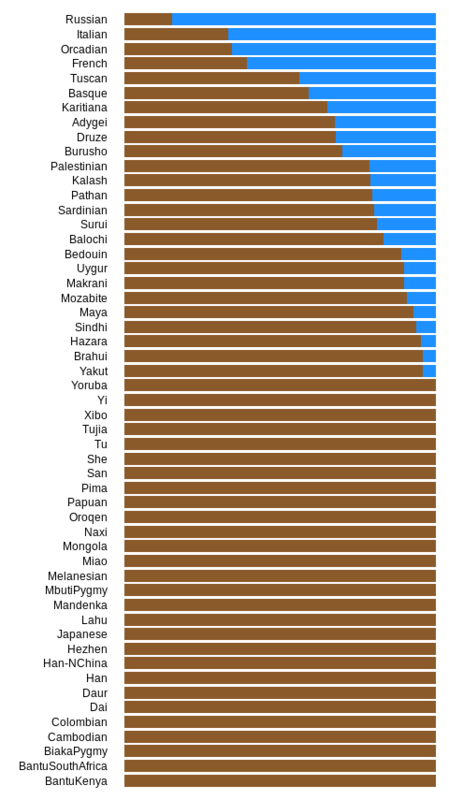 The G allele is present in the Surui at a frequency of 0.188, but none of them are homozygous for it. The G allele is present in the Maya at a frequency of 0.071, but none of them are homozygous for it. The G allele is absent in the Colombians and the Pima. Below is a plot of the allele frequencies. The A allele is brown and the G allele is blue. Below is a plot of the genotype frequencies. The AA genotype is dark brown, the AG genotype is light brown, and the GG genotype is blue. Below is a table of the allele frequencies. Below is a table of the genotype frequencies.